I wasn't until after I got home that I began to wonder just what I thought I was going to do with them. While I love the flavor, I am not so fond of the fruit. 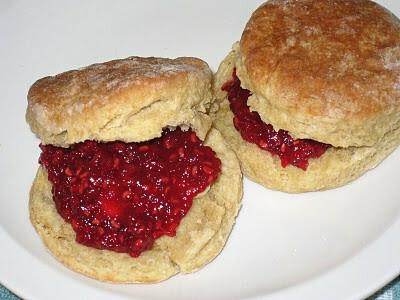 But I am fond of raspberry jam, so I decided to make some. I had already been experimenting with making my own jams from both fresh and frozen fruits. It is surprisingly easy. You just cook the fruit down with sugar, lemon juice and lemon zest until it has reduced to the thickness you want. It started with the strawberry jam I made a few years ago, but it didn't take off until this year. So far I have made blueberry jam, the raspberry jam you see here, and several batches of fig jam. All have been delicious, especially on my flaky buttermillk biscuits. These are what I believe is called "freezer jam." I am nowhere near the idea of canning. Not that I haven't thought about it, mind you. I just don't have the space, either to do the canning or to store the end results. This jam will last a few weeks in the refrigerator, and it can be frozen (hence the term freezer jam). So when I make a batch, I usually freeze half of it immediately, since I am not likely to eat that much jam in such a short time. Does this mean I will never buy jam or jelly again? Probably not. But it does mean that I can have it whenever I need it, as long as I have some fruit around the house. And, more to the point, I know exactly what is in it when I make it myself.